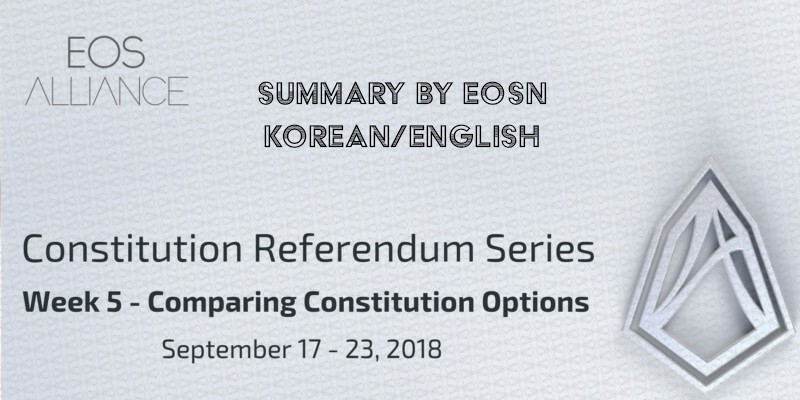 Week #5’s Korean/English Call of the EOS Alliance Constitution Referendum Series was scheduled for Wednesday, September 19 at 9:00 pm Seoul Time / 12:00 UTC. This week, participants were asked to directly compare Constitution version #1 to Dan Larimer’s version #2. The call had 8 participants, so there was no need to go into smaller groups. After the earlier “English Only” call dealt with article 1, 2 and 4, this group decided to start with article 5 of Dan Larimer’s Proposal. Regarding the most recent hack where a bad actor made fake EOS — his intent was clear, he stole EOS — would he be liable under Dan’s v2 of the constitution? On a more general note, it was agreed that it would be necessary to have official translations for the new constitution proposals, possibly before they are put to vote. Also: Contracts that are written in English and/or other languages could be different when translated. Sub-documents, glossaries and 2nd Level Law (also in other languages) would be very useful to avoid misunderstandings. The general intent of both articles seems to be to protect Block One. In Version 2 Dan got rid of the exact number of percentage whereas in Version 1 10% is clearly mentioned to be the most one entity would be allowed to own. How ownership can be proven if one actor separates his tokens in multiple wallets? Would bonds be a tool to hold “whales” accountable through reputation? Should the voting threshold for amending the constitution be raised? Is 15% sufficient or should it be higher? What would be an accurate number of circulating supply since tokens are in the EOS savings account or not claimed yet from ERC20 Tokens? The article means that a contract only becomes valid when it’s published via transaction on the blockchain. It basically means “Read the terms and conditions before you sign the terms and conditions”. At this point the time was up and we discussed ways to improve the calls. The main focus was on participation. The amount of 8 participants can and should definitely be improved. An EOS Alliance account on Koreos or KakaoTalk would be an option to improve outreach to the Korean Community. Who would be responsible to set up and/or manage this account is still to be determined. Next week’s scheduling of the Korean call then was discussed as well. Since there’s a Korean National Holiday coming up it would be necessary to adjust the schedule accordingly. Thanks for reading and see you on the calls, Martin.